This year shaped up for the mother of all radio battles, but perhaps not the one you were expecting. 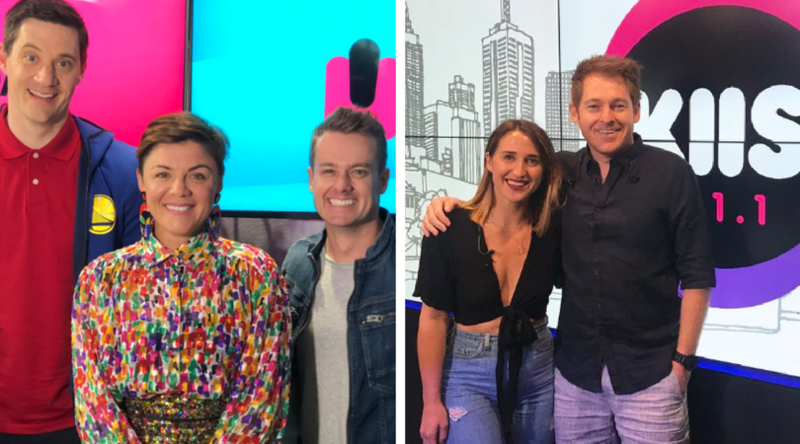 Two stations with new Breakfast lineups and Drive shows in 2018 were Southern Cross Austereo‘s 2DayFM Sydney and Australian Radio Network‘s KIIS FM Melbourne. Both stations went into the year are expecting positive turnarounds, so how did they fare? With the final GfK survey result of the year released this morning, we can officially declare KIIS 101.1 the winner, under the direction of ARN’s Duncan Campbell and former 2DayFM content director, Derek Bargwanna. They finish the year with a 6.1% share of listening overall among People 10+, while Breakfast show Jase & PJ end the year on 5.7%. 2DayFM certainly struggled to make an impact this year, and despite the best efforts of SCA’s Guy Dobson and Gemma Fordham, the station finished with 5.4% overall. On Breakfast, their show that ends the year with a lineup of Ed Kavalee, Grant Denyer & Ash London – end the battle with 4.6%. Perhaps the tightest aspect of the battle came on Drive, with Hughesy & Kate having their lead overtaken in the final book of the year, handing line honours to Will & Woody. Let us know what you think happens to these stations next year in the comments. You can also catch up on all the rest of the results, ratings cards and talking points from the final survey of 2018 here. SCA and ARN two great content companies. May the best team win ! Dobbo’s got this I reckon. Even with Em 2Day should do ok.
KIIS for sure. Jase and PJ are hilarious! Battle to the bottom is right neither station will grow much this year. The above graph makes it look like KIIS is performing better, yet it is 2DAY that made progress in Survey 1. 2DAY can claim a healthy rise in the 25-39 demo while also maintaining share at breakfast and drive despite many personnel changes. Unfortunately the bold changes to both breakfast and drive sent KIIS backward, though not far below the 6 to 7 per cent of 10+ that Melbourne’s 101.1 FM has hovered between for a very long time now. Easter Monday is remarkably 30 years since this station dispensed with its original identity (3DB as it was known on the AM band), initially rebranding as 3TT, which took only 12 months to establish itself with a solid rating share, particularly in the 25-39 demo. Soon after migrating to FM (as TT-FM) the station experienced its most top ratings run in the mid to late 90s, nipping at the heels of FOX and 3AW for at least 5 years, having evolved during the 90s from playing classic hits to Hot AC. Since about 2001, after many branding changes, format adjustments and a revolving door of breakfast presenters, it seems to be perpetually ratings-challenged. The latest book appears to reflect that long term ratings challenge. In particular, Jase and PJ appear to be off to a struggling start, yet given the brief history I’ve outlined, it’s a safe bet they’ll be hovering between a 6 and 7 share before long. That neither means being a ratings disrupter or disaster. This station appears to be stuck where it is. I think KIISFM which is in a similar bind to 2DAYFM will do better over the 12 months. It’s breakfast show is proven and just sounds better. 2DAYFM is relying on old music. Listeners after initial curiosity will go back to their favourite station. 2DAYFM will never be anyone’s favourite station but KIISFM has chance. You can’t rely on TV talking heads they are not necessarily good on radio. I’m surprised by KIIS’ results. They deserve more. But again, they’re new to the Aussie market so give it time and ratings will reflect them. They can only go higher. Much better than the previous breakfast show, ARN did the right thing changing the shows. Tommy you must live under a rock. 2Dayfm is an oldies station not relevant anymore.They will struggle all year. Grant Denyer is no saviour another tv bloke should stick to tv. SCA should change that brand like ARN did because its going nowhere. Both these stations are doomed for the next few years. It’s a race to the bottom. KIIS in Melbourne is doing much better than 2DAYFM. With all the programming power at SCA you would think 2day would do better. Look at the drive figures. KIIS all the way. 5.2 plays 5.6 so KISSFM Melbourne wins. KIIS winning drive too. The new show isn’t great but its beating 2dayfms offering. And KIIS beating 2day brekky too. My money is on Duncan, DB and Rob. ” Listeners after initial curiosity will go back to their favourite station. 2DAYFM will never be anyone’s favourite station ” SCA’s Sydney plans for 2019 will be interesting. 2DAYFM wins Overall and Breakfast and KIIS wins Drive. Rove and Sam did a 3.8% and now Em’s show is on 4’s not out of the woods yet. Long way to go. Dont think they will go the distance. ARN and KIIS WINNING Melbourne Breakfast and Overall. SCA pull your socks up. The only area SCA win is Drive because they stole Hughesy and Kate and KIIS have been left with Will and Woody. I thought SCA would have this in the bag but seems ARN are kicking their but. At least ARN are trying new young unproven talent from New Zealand. SCA just grab anyone from TV and think they can excel at radio. Emazing. That new CEO at ARN is kicking goals. Go ARN ! I bet ARN’s KIIS lineup in Melbourne is a lot bloody cheaper than SCA’s 2Days all “ star “ lineup. Pity the poor shareholders. 2Day just play music 24/7. Really doubt that. Breakfast now rating 4%. Time to give more music strategy like Smooth a go. It’s not working Southern Cross Austereo. Rove and Sam did a 3.8% and now Em’s show is on 3.3% Can’t see that show resturning in 2019. Why is this a thing? Who made this a thing? This isn’t a thing. I’m glad Denyer has got a new TV job to go to soon. 2Day now only win drive which they stole off ARN. KIIS winning Breakfast and Overall as of Survey 5. My moneys on Duncan and DB. The Mother of All Radio Battles is actually 2CH versus 2Dayfm. And CH is winning. The mother of all radio battles is happening up in Sydney. Southern Cross Austereo’s 2Day FM and 2CH. There are a number of similarities – both have a 10+ share of 4.2% and a breakfast share of 3.3% ! They are also offering audiences a very quirky musical mix. 2DAYFM Breakfast BIG FAIL ! And they are going into 2019 with same lineup. Nova and KIIS must be very happy. Congratulations Duncan and ARN. They fought a very good fight. 2Dayfm is still a shambles with a breakfast show that no one cares about. The ‘ brains ‘ at SCA will need to re think 2Dayfm again in the near future. Hughesy & Kate having their lead overtaken in the final book of the year, handing line honours to Will & Woody.